Finding a career in football was never a big issue for young Joey Bosa who was already famously known for his athletic prowess from his high school days, thanks to his family’s football history. The American football defensive end who was Chargers’ first-round pick (3rd overall) in the NFL 2016 draft has groomed himself for the best. He sits comfortably among the top five defensive ends in the NFL. 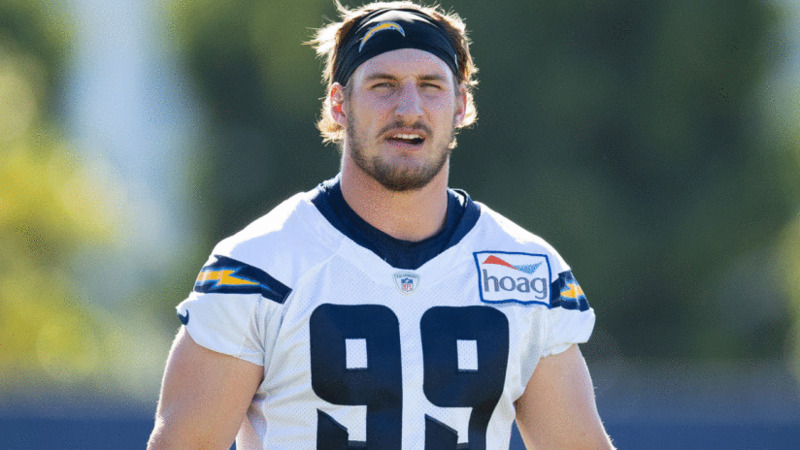 Since his rookie season where he recorded a single fumble, 41 tackles, and 10.5 sack, Bosa has not failed to prove that he is worth the Los Angeles Charger’s pick. His strength and technicality is one you would only find in a well skilled and experienced player. Get to know more about the great player. Joseph Anthony Bosa was born on July 11, 1995, in Fort Lauderdale, Florida, USA. He is the son of John Bosa who also played defensive tackle as a collegiate and was selected by the Miami Dolphins in the first round and 16th overall of the 1987 NFL Draft. Bosa’s mother’s name is Cheryl Bosa, his younger brother Nick Bosa also plays football in defensive positions. Bosa’s great-grandfather, Tony Accardo, was a Chicago-based American mobster, popularly known as “Big Tuna”. Joey has an American nationality and his ethnicity is American too. At St. Thomas Aquinas High School where he attended, Joey began his football career journey but not without the help of his father who trained him on the basics. Following his football excellence, Rivals.com ranked him a four-star recruit. He was also rated as the fourth-best defensive end in his class. Moving to Ohio State University in April 2012, Joey performed better, winning many awards and accolades. Both College Football News and Sporting News named him freshman All-American after his 44 tackles and 7.5 sacks in 10 of 14 games record. He also recorded 55 tackles and 13.5 sacks in his sophomore and 47 tackles, with 5 sacks and one interception as a junior. He left the college football for the NFL just after his junior season. He finished his college career with a total of 148 tackles and 26.0 sacks and was named Big Ten Defensive Player of the Year, Big Ten Lineman of the Year, and First Team All-American. He crowned it up with the Lombardi Award Finalist. Joey joined the professional league in 2016 and was luckily selected by the Los Angeles Chargers on April 28, 2016. By making it as the third overall during the draft, Joey became the first of five players from Ohio, to be drafted in the first round of the NFL 2016 Draft. Joey debuted in his regular season on October 9 after suffering from a hamstring injury. He played in 27 snaps in a game against the AFC West rival Oakland Raiders and finished with 4 hurries, 2 sacks, and one hit. He was then named the Defensive Rookie of the year, after finishing his rookie season with 41 tackles, one fumble, and 10.5 sacks. His rookie performance also placed him as the 100th best player on the NFL Top 100 Players of 2017. Joey Bosa went into his second season in the NFL with more determination and mind-blowing records and it worked out just as he thought. He finished his 2017 season ranking 7th in the NFL defensive ends after recording 70 tackles and 12.5 sacks. His performance also earned him his very first mention for the Pro – Bowls in 2017 and boosted his total career stats to 130 combined tackles, 98 total tackles, 27 sacks, 5 forced fumbles, and 1 recovered fumble. In his 2018 regular season, Joey recorded 15 total tackles and 4.0 sacks. The defensive player was injured during 11-on-11 practice ahead of the Chargers’ season opener against the Kansas City Chiefs. The injury did not only keep him out of the preseason, but also kept him away from the beginning of the regular season. Following the four-year contract Joey Bosa signed with the chargers, the defensive player is believed to be earning quite big. The contract signed on August 29, 2016, was with signing bonus payment of over $17 million, which is higher than any rookie has received in the last two NFL drafts. Joey’s net worth is estimated to worth $9.4 million. The defensive end player for the Los Angeles Chargers stands at 6 feet 5 inches tall, supported by a weight of 127 kg. His measurements before joining the NFL draft shows he was 6 ft 5 1⁄4 inches (1.96 m) with a body weight of 122 kg (269 lb). The length of his arm was 33 3⁄8 in and the size of his hand was 0 1⁄4 in.